Ubisoft follows up its fantastic version of Monopoly, and not so fantastic version of Risk, with another take on a classic board game in Trivial Pursuit Live! Trivial Pursuit Live! 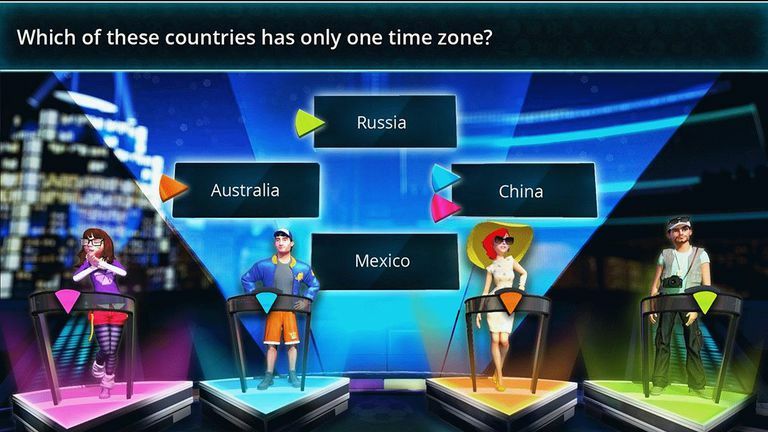 turns the old-school trivia game into a multiplayer game show that works pretty darn well. There is no classic Trivial Pursuit mode, unfortunately, but everything else is well done here and trivia fans will have a good time. Our full review has more. Pros: Solid trivia game. A fresh take on Trivial Pursuit. A Fun party game. Cons: No classic Trivial Pursuit mode. Trivial Pursuit Live! is a game show version of the classic trivia game. Up to four players answer questions to collect wedges, and the first player to fill up their "pie" wins. The game itself doesn't work like the classic board game, however. You don't even need to get one of every color of a wedge to win. It is a multiplayer game show, so instead of taking turns, everyone can answer every question. Each question is worth a steadily increasing amount of points, and you just keep answering until you reach specific milestones. Each game is split into either 3 or 5 rounds, and each round is slightly different. In one round everyone just pushes the correct face button to chose their answer. In another round the question might be more general, like "Which of these animals lives in the Arctic," and everyone either takes turns picking answers or it's a mad dash where you can pick as many as you can. Another round might give you 5 answers that are all technically correct. Everyone gets points, but the players that choose the higher-ranked answers get more points. There are some other round types as well. The game can be played in local or online multiplayer. You only have a limited amount of time to answer questions, so online players can't drag their feet and play slow and ruin it for everyone else. The achievement list is mostly "Answer X# of Questions in Category Y", so you'll earn most of them fairly quickly. The presentation is fairly decent. It really looks like a game show, and the character designs look okay. The games move along at a fairly brisk pace, too, so you can play a 5-round game with 4-players in around 30-minutes, which is pretty good. While there is an announcer, they mostly just explain the rules of each round or mention that a player has answered X questions in a row. The questions are not narrated, unfortunately, so you have to read them yourself. Since there aren't any rounds that make you buzz in, even slow readers have a fair shot, though. The music is also very game show-esque. In the end, Trivial Pursuit Live! is a fun game, and the fresh take on the classic with the TV game show aesthetic works well. Multiplayer is a blast and the pace of the game is nice and fast, and trivia is just plain fun almost no matter what. It actually brings back fond memories of Microsoft's 1 vs. 100 on Xbox Live, which is definitely a good thing. The price is maybe a little steep (a classic mode would have helped a lot here), but if you have friends to play with or just love trivia, Trivial Pursuit Live! is worth a look. The game is also available on Xbox 360.